Happy post-Thanksgiving Monday! I don't know about you, but I would love to be wearing sweatpants at work today... between Thanksgiving dinner, the leftovers, and dining at some of our favorite Chicago spots with Emma and some girlfriends this weekend I am still feeling full! And speaking of leftovers, my fridge is still filled to the brim with them despite the fact that Emma, Alex, and I tried to eat our ways through them all weekend. Truthfully, I'm getting a little tired of eating straight leftovers so I decided to change them up a little bit to keep things interesting and tasty. I transformed our leftover turkey into a really tasty turkey noodle soup, which made the perfect Sunday dinner for us-- it was light, but still comforting, and so easy to throw together. I used this recipe from Two Peas & Their Pod and subbed in turkey instead of chicken. Yum! 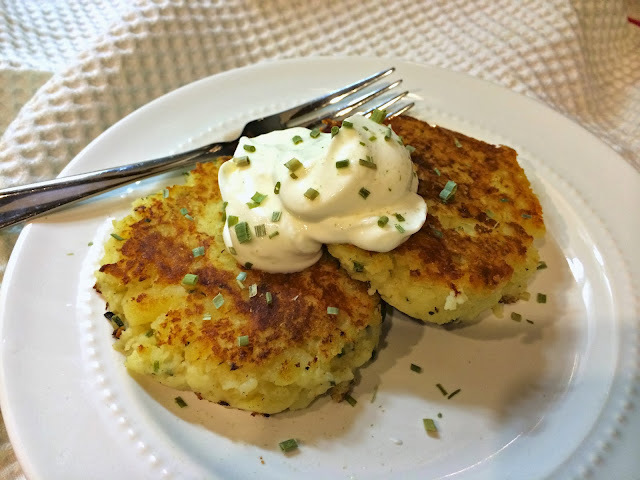 The real star of dinner though, were these cheddar mashed potato cakes. Alex is not a big fan of plain mashed potatoes and since we had so much leftover I knew I needed to do something to transform them. 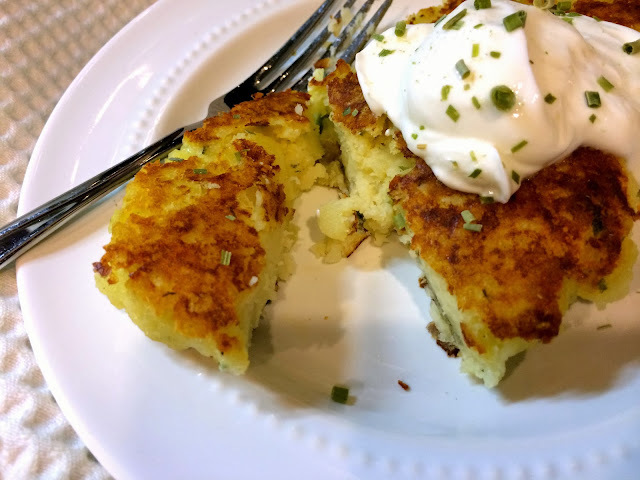 These potato cakes are really tasty-- sharp cheddar, Dijon, and herbs kick up the sometimes bland flavor of potatoes and the panko adds a nice crunch to the texture. They're great on their own, as a side dish for almost any protein, and are tasty with a variety of toppings. I like sour cream or plain Greek yogurt on mine. You could also add crumbled bacon, additional shredded cheddar, applesauce, or you could try BBQ sauce as my husband would recommend. In a large mixing bowl combine the beaten egg, potatoes, Dijon, and milk. Stir in the milk a little at a time, adding enough to moisten the potato mixture so that the consistency is smooth, not crumbly. Add the remaining dry ingredients: chives, parsley, panko, and cheddar and stir to until ingredients are fully incorporated. Using your hands, roll the potato mixture into balls (just slightly larger than a golf ball). This recipe should yield about 8-10 balls. Gently press each potato ball down to create cakes that are about 1/2-inch thick. Add just enough oil to cover the surface of a nonstick skillet and heat over medium high heat. 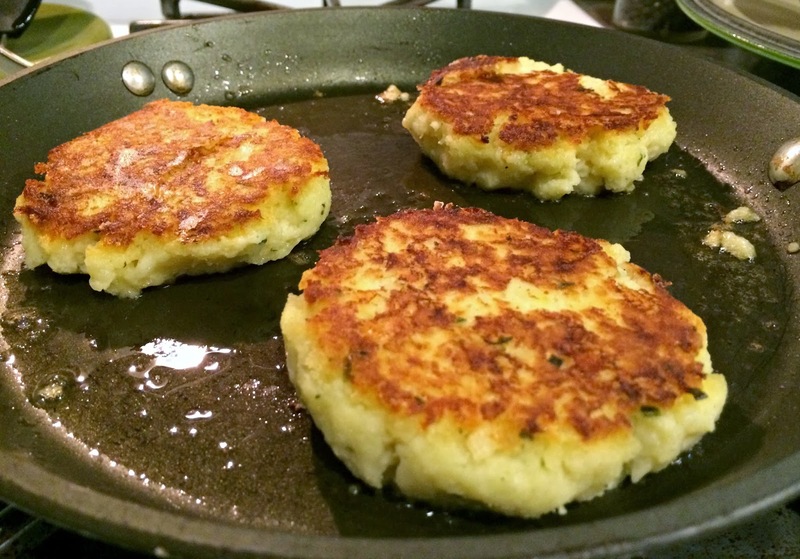 Once oil is hot, add a few potato cakes to the pan at a time leaving ample room around each. Cook the patties until browned on both sides-- approximately 4 minutes on each side. Transfer cooked potato cakes to a paper towel-lined plate. Repeat with remaining potato cakes (I had to cook mine in 3 batches). Serve warm with topping of your choice.